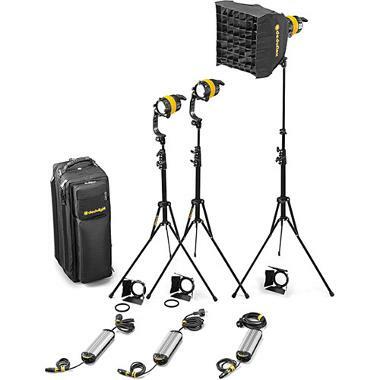 The Dedolight Bi Color LED Kit is a complete continuous lighting kit suitable for both still and video production. LED lighting is cool to the touch and lightweight. These lights cool passively so there are no loud fans to contend with on set. They are fully tiltable with permanent friction and accommodate DC battery packs up to 18V (batteries not included). Using aspheric lens elements gives these lights a 1:20 flood to spot ratio and a beam angle of 60-4º. The lights can be dimmed, are flickr-free, suppress color shifting, and only draw about 47W in power. Also included is a 12" x 12" mini softbox. These lights work well for documentary lighting, narrative film lighting, lower-key product lighting, and replicating window light. This kit includes the mobile version, not studio version, of Dedolight Bi Color DLED4.1 heads. Operation is the same with the exception of being without DMX control.